Adaptation of the 19th-century Russian novel by Goncharov, first published in 1859. Oblomov is often seen as the ultimate incarnation of the superfluous man, a symbolic character in 19th-century Russian literature. Oblomov is a young, generous nobleman who seems incapable of making important decisions or undertaking any significant actions. He passes the days in bed indulging himself with food and aimless pondering, he reminisces about his childhood and the life he's led, and he discovers a fulfilling poetry to his life. 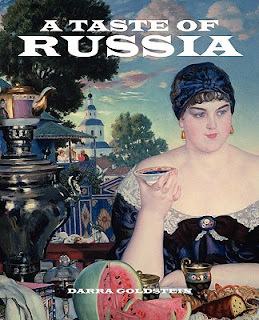 The book was considered a satire of Russian nobility whose social and economic function was increasingly in question in mid-nineteenth century Russia. Goncharov's work added new words to the Russian lexicon, most notably "Oblomovism" — a sort of fatalistic laziness that many critics described as an integral part of Russian character. With over 200 recipes on everything from borshch to blini, from Salmon Coulibiac to Beef Stew with Rum, from Marinated Mushrooms to Walnut-Honey Filled Pies, Darra Goldstein's A Taste of Russia shows off the best that Russian cooking has to offer. Full of great quotes from Russian literature about Russian food and designed in a convenient wide format that stays open during use. "The first and foremost vital concern at Oblomovka was food. What calves were fattened there for the holidays! What fowl were raised! How many subtle considerations, how many pursuits and worries there were in taking care of them! The Turkeys and chickens intended for name-days and other celebrations were fed on nuts; the geese were deprived of any exercise at all and hung motionless in a sack for several days before the holiday, so they would swim in their own fat. What stores of jams and pickles and cookies there were! What honeys! What kvasses were brewed, and what pies were baked.